Blocked nose and mouth breathing happen to be typical signs of hyperventilation. Through this simple breathing exercise, which is a completely natural remedy, to unblock a nose was initially developed by Russian doctors. It was taught by more than two hundred Soviet and Russian medical doctors to hundreds of their patients with blocked noses. According to the clinical experiences of these doctors, a majority of their patients could easily unblock their blocked nose naturally and continue with their nasal breathing in about 1 minute or 40 seconds. Unblock a blocked nose in 1 min during night sleep too. This natural trick-tip unblocks the stuffy nose in people with allergies and colds as well. Start walking briskly with your blocked nose pinched with fingers, and your mouth closed at all times. You would probably be able to make about thirty steps. While walking, it is necessary for you to hold your breath until you feel a strong urge to breathe. Now, sit down and relax with your spine kept completely straight. Keep focusing on your breath. Resume your usual breathing with your mouth closed once you release your nose. However, you must not take a big inhalation. Instead, you need to take a smaller inhalation and then relax all your body muscles for exhalation. This particularly includes the upper chest muscles and other muscles used for respiration. Now, take another smaller inhalation and relax again. This reduced or shallow breathing needs to be practiced with each inhalation while remaining relaxed. The basic aim here is to maintain air hunger for nearly 2-3 minutes while totally relaxing all of your body muscles. It is fine if your breathing is frequent during this shallow breathing or reduced breathing. The success rate for this natural remedy is over 90%. The results are better achieved by people who practice diaphragmatic breathing during this exercise while trying to clear a blocked nose. However, if your breathing gets big later, there is a good chance that your nose will get blocked once again. If that happens, just repeat this exercise. Lie down on your abdomen or on your left side and relax all the muscles of your body completely. Next, with your nose pinched, follow all of the instructions (see above) related to breath holds and reduced breathing. Quick relief is guaranteed. However, if your nose continually keeps getting blocked, it is vital for you to increase your body-oxygen levels up to 20 second – it’s a permanent remedy! Our automatic breath pattern has the potential to impact cell oxygenation and blood supply to all tissue rather significantly. 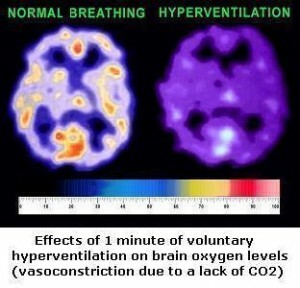 You need to bear in mind the fact that whenever breathing becomes a little faster or deeper, delivery of oxygen to body cells reduces dramatically. What are its probable causes? To begin with, mouth breathing has the potential to negatively impact multiple physiological processes and reactions within the human body. For instance, sleeping over your back can make you breathe nearly 2 times bigger (in terms of minute ventilation), thereby cutting down on body oxygenation and triggering mouth breathing, snoring, sleep apnea, panic attacks, anxiety, cramps, headaches and a number of other problems. However, you can easily resolve all of your problems with rhinitis or sinusitis, better known as nasal congestion by retraining your automatic breath pattern so that you can easily hold your breath for 25 seconds or more without any stress after your usual exhalation, even at night. You will not need to unblock your nose again this way. All in all, the ultimate natural remedy to every single problem associated with a blocked nose is to attain normal breathing parameters 24/7. This is basically going to help you maintain adequate body oxygenation at all times. For this purpose, breathing retaining holds utmost importance. Breath holding and reduced breathing exercise to increase body O2 levels.It is clear that breathing less at rest improves O2 delivery to body cells and unblocks the blocked nose fast. Is it faster to clear a blocked nose with walking and breath holds or by nodding the head and breath holding? Generally, you can get rid of a stuffy nose sooner with walking. But, for example, at night, just breath holds are great to clear a nose, stop coughing, and fall asleep faster.